The internet invasion started slowly. But then it came all at once. Suddenly, we're checking email at 3 a.m., fighting with our kids to make them shut down their devices, and staring at screens instead of making eye contact. No one asked for this life, but here we are: wasting time online, getting distracted (even when our phones are off! ), and playing catch-up on all the latest stuff our kids are doing on Snapchat, Instagram, YouTube, and who knows what else. It doesn't have to be this way. A new wave of so-called "digital wellness" features designed to prevent screen overload is taking hold in some of the most popular tech tools. From operating systems including Apple's iOS 12 and Google's upcoming Android Pie update to social media like Snapchat and Instagram, you can see exactly how much time you're spending online, set limits for yourself and your kids, and reduce distractions and interruptions from notifications. You have the right to remain skeptical. The idea of tech companies trying to help us stay off their products -- after using every trick in the book to keep us hooked -- is pretty ironic. And there's no proof that digital wellness features work -- much less help mental health issues associated with technology use, such as anxiety, depression, and addiction. But if you're concerned about your tech use, as well as about your kid's, they're certainly worth trying. Whether they help depends a lot on your family's needs, your kids' willingness to be on board, and the kinds of conversations you have around self-regulation. Take a look at some of the most popular platforms' efforts to protect your digital well-being. Usage report. A daily and weekly readout of the time you're spending on your device. You can see exactly how much attention you and your kids pay to app categories such as social networking versus, say, reading and reference. Downtime. Turns the phone off during a specific period of time -- for example, 9 p.m. to 8 a.m.
App Limits. Sets daily time limits for app categories such as games and entertainment as well as for individual apps. Always Allowed. Lets you choose which apps (for example, music apps) that never turn off -- even during downtime. Content & Privacy Restrictions. 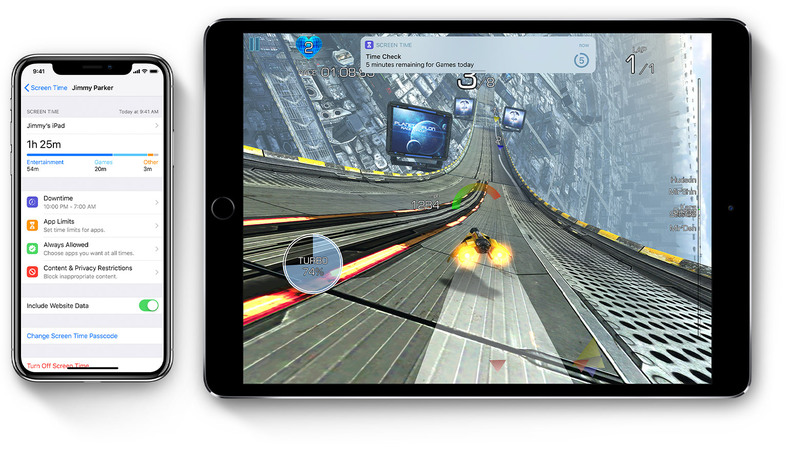 Controls what your kids can see (such as mature content) and do (such as download and delete apps). Also puts limits on how much information third parties can access about your kid. Dashboard. Graphs the time you've spent in individual apps and lets you set daily time limits for apps that keep you hooked longer than you'd like (for example, 15 minutes tops on Snapchat). Do Not Disturb. Silences your device entirely or allows you to specify which alerts you want to see (or not). Notifications. Personalizes your alerts, so you can snooze them and schedule them at a convenient time. Wind Down. Automatically turns your phone grayscale and enables Do Not Disturb at a time you specify. Time Watched. 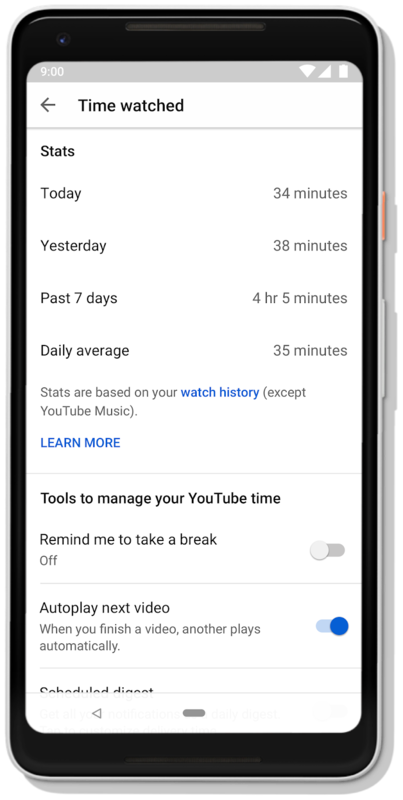 Available only on the app, these stats show how much time you've spent watching videos for the present day, the day before, and the past week. Within this feature, you can also set a reminder to take a break after a certain amount of time and disable autoplay so you won't get sucked in to watching endless videos. Restricted Mode. Though it's been around for a while, Restricted Mode, found on the main Settings page, can be a helpful additional setting to give you some peace of mind. It limits mature content from showing up in your kid's feed (it's not perfect, though). Activity Dashboard. Displays a daily average of the time you've spent on the app for the week. Daily Reminder. Allows you to set a time limit and receive a notification when you've hit your limit. Mute Push Notifications. Silences push notifications (you can also turn them off entirely in the app's settings or on your phone's settings). Mute story. Muting a story pushes the friend down your contacts list, effectively making their posts the last in line. Message notifications. You can silence all notifications so they won't disturb you. Restricted Mode. Filters out videos that may not be age-appropriate. Time per Day. Displays a daily average of the time you've spent on the app for the week. Manage Your Time. Allows you to set a time limit and receive a notification when you've hit your limit. Mute Push Notifications. Silences push notifications (you can also turn them off entirely in the app's settings or on your phone's settings) or choose which alerts you want to get.